Seems like it's been heavy on downs in the last year. It's as if every time I go to pick up my homeschooling responsibilities a bomb drops. It leaves me wondering: am I somehow falling off the path, is it the enemy, or is it the normal strife of a homeschool house that includes three kids - one a toddler! I'm guessing it's a mix of all three. I've been purposely quiet on all fronts for awhile. I felt strongly that God was calling me to lay it all down. That was hard for me. I noticed feelings of regret - as if, by not pursuing these things, I would never become what I knew I could be. ...and then He hit me with this revelation: You are struggling, because you want to be something more than who I've called you to be. By doing what He calls me to do, I am following His best for me and His call for me. My wanting more is just selfish and self-glorifying. I want to do something big. I want to be something big...by my own right. How ugly! I'm seeing my own success through the clouded eyes of the world. I chose to follow Him. It hurt, but I lay it all down, and I'm only picking up each piece as He calls me to it. 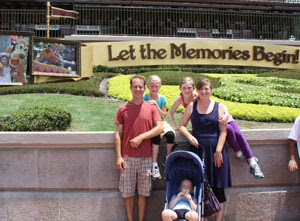 I got a really big bonus out of the deal: a family trip to Disney World and Panama City Beach! I never would have dreamed for this extravagance. We didn't even have the money in the bank to cover it. A few months before, I'd half-hazardly asked that he would provide us with a vacation this year (our last was 6 years ago). I didn't expect it to be much, because I know there are things much more important in the world than the O'Haras taking a vacation. But...God started talking to me about extravagance, and I started thinking about taking the kids to Disney. (I know...it's terribly commercial.) And I asked Matt what if we started saving and just planned on going next year, and he said, "Well...I've got vacation time in a few weeks. Let's just sell the camper and go." So, I posted our little pop up on craigslist on Saturday, sold it on Monday, and had the trip booked byTuesday - just under 2 weeks before we left. Granted we had to use some methods I wouldn't recommend to get the whole trip done. God specifically said to me, "You're going to have to let me provide this MY way." I'll admit I didn't particularly like "His" way, but I trusted him, and we are currently free and clear on a 10 day vacation to Disney and the beach. And it was a most peaceful and blessed experience. We've been walking through some pretty tough things in the last year. It hasn't been easy. What did I expect? Following Jesus IS NOT a cake walk! We are doing everything we can to trust Him and be true disciples. There are ups, and there are downs...and very often I feel like I'm in over my head. So, we're going to go to an adoption class and see about adding another little blessing to the mix...why not?! I guess, the point is, it's okay that it doesn't feel good - that it doesn't feel good A LOT of the time. I know without a doubt, that the rewards of serving a good and righteous master far surpass the discomforts; and, even when I am down, I am mountains high and oceans deep more fulfilled following Him than I was when slave to the fleeting pleasures of sin. Oh...and...we've started homeschool. But more on that later.